In Rennes, in the northeast of France, the Le Crsyto office building is located, a project in which the PORCELANOSA Grupo has taken part. It is a building with unique volumetry, where the development of a special diamond-shaped structure working as a support of the façade volumes has been carried out. 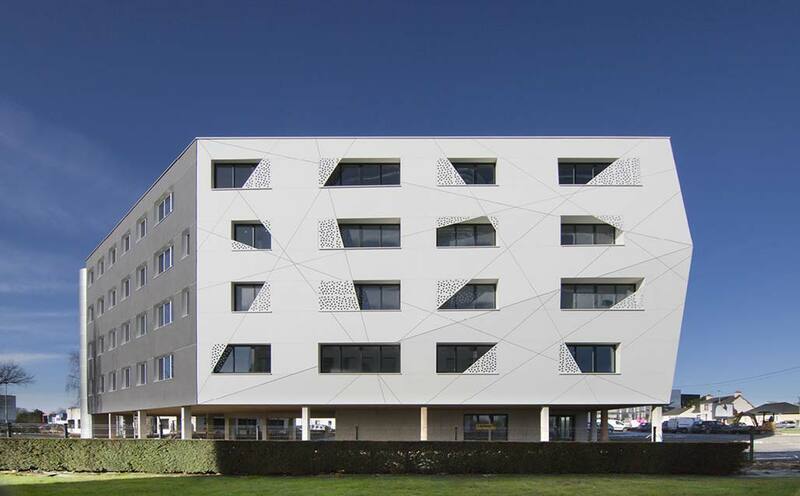 Butech has been the firm in charge of the building systems through its innovative ventilated façade system in this project by Atelier Loyer Architectes. The studio has opted for the revolutionary ventilated façade system combined together with the KRION® Solid Surfacemineral compact, installed by means of the K-Fix system. The Lux 1100 has been the chosen KRION® model, in a bright white which makes the area of the façade (800m2) seem more spacious in visual terms. It is worth highlighting the fact that, first of all, a scale model of the work was carried out, through which Atelier Loyer Architectes took into consideration the technical data from Butech regarding its façade system installation. The technicians from the PORCELANOSA Grupo were those who designed and worked on the façade structure and supervised its installation. The result was a ventilated façade with outlets ranging from 20mm to 800mm regarding the closing, made up of diamond-shaped volumes. As far as the project design is concerned, it is worth pointing out the use of the KRION® acrylic stone on the façade surface for this office project, whose fabricators were the Valencian firm, Indutec, and the French firm, Laisné. Additionally, the state-of-the-art mineral compact was used to create fixed brise-soleils on the building’s windows, through fixing systems developed by Butech. They provided the façade design with a unique look, as well as very dynamic and avant-garde design.